Algae and Blanket Weed requires sunlight, carbon dioxide and nutrients to grow. Nishikoi Clear Waters contains Microbes. This ensures that during warmer water periods they will flourish and feed on nitrates, stopping the return of the algae. Clear Waters also contains algaecide which is the quickest and most effective way of killing algae straight away. 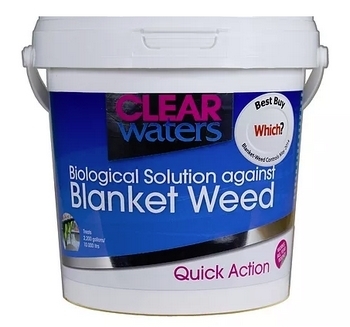 Unlike other algae and Blanket Weed treatments, Clear Waters will also work in the colder months if the Algae and Blanket Weed are actively growing. Clear Waters will yield results down to a water temperature of 4 degrees centigrade. This powder solution is safe for use with UVC's, pond filters and really is a powerful treatment against blanketweed. You can expect to see results within just 2 weeks of its first initial use.